COST: The smallest pallets are $38 for six colors. THE SKINNY: This is the best eye shadow I've tried in quite a while. The colors are vivid. The shadow is creamy and blends easily. It's not chalky and doesn't fly into the corners of my eye when I apply it. And it lasted most of the workday with primer. The texture is really close to Urban Decay's eyeshadow, which is my hands-down favorite. My sample came in pink and several brown and bronze tones, which were really pretty with my fair skin. They were rich, but appropriate for work. If you haven't heard the story, the line is created by Michelle Phan, who created a popular YouTube video tutorial series about makeup. 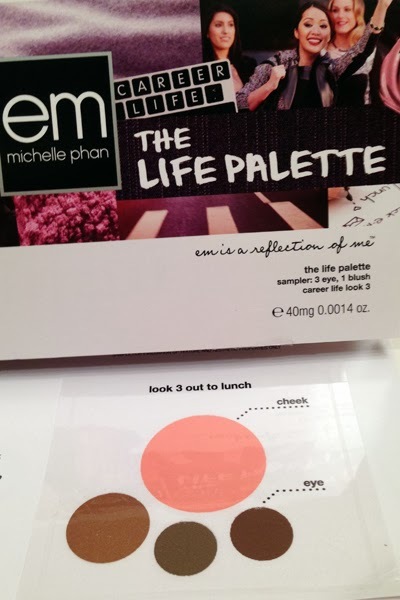 In August, she launched a cosmetic line called EM Michelle Phan in conjunction with L'Oreal. The pallets seem expensive, but even the smallest ones come with six colors that all work together. And her website runs a lot of free shipping deals and sales, although you do have to hunt to find the codes. CHECK IT OUT: No doubt, this woman can put together pallets. Check them out online.